Hey folks! I know a few of you have kept up with it anyway, but the Time Log webcomic just finished it's run on Thanksgiving! We're planning to bundle it up with the original print comic and try and sell the whole thing as a graphic novel (so if you're friends with any graphic novel publishers, let me know!). Anyway, it was a massive project that ran for over a year over there on the Audioshocker. So, hopefully, now that it's finished, any of you who haven't read it, or stopped part way, can go read and enjoy the whole story. You can start from the beginning here. Fille de Dieu, va, va, va! You probably wouldn't know this already, but for eight or nine years I've been tremendously under the spell of a mid-1930s oratorio written by Arthur Honegger called Jeanne d'Arc au Bucher, or "Joan of Arc at the Stake," which is almost never performed. It's a big, sprawling affair for large chorus, orchestra, several actors, and a few vocal soloists. There's a children's chorus and an ondes Martenot involved. It's only really viable when performed in French. Paul Claudel wrote the text, rooting the story in the scene of Joan of Arc about to be burned at the stake, but conveying her life in a series of wildly variegated flashbacks: tried and judged by barnyard animals, watching her fate sealed by a parodistic kings' card game, reuniting France in a hearty, allegorical folk festival. Honegger threw the kitchen sink at the project, creating a smorgasbord of dusky expressionism, passionate neo-baroque choral work, misty impressionism, and cheesy dancehall jazz, with bits of folk song, plainchant, and satirical neoclassicism added for good measure. Reading about it, talking about it, you feel like it's got to be arch and antiquated and essentially batty. In actuality, it's surprisingly earnest and deeply affecting. As I mentioned, it's barely ever performed. But lo and behold, the Baltimore Symphony Orchesta's conductor, Marin Alsop, picked it up this year. And she brought it to Carnegie Hall, too, so I could go with Maddie, which made me incredibly happy. And Mandy and Tabitha came too, although they didn't sit with us since they got their tickets later. Nate and I heard it in Vienna in 2001, when I visited him during his semester abroad. This is the trip when we heard ten concerts in the first seven days I was there, and among them was a German-language Jeanne d'Arc by the Wiener Symphoniker. I remember it as a concert we had a tremendous amount of fun with, since it's this nutty twentieth-century piece, but it wasn't for a couple of years that one of its principal melodies became re-stuck in my mind ("Fille de Dieu, va va va") and I went out to Tower Records at Lincoln Center to get it on CD. On further listening I found myself devastatingly absorbed in the music, and wrapped up in it in a fairly adolescent manner during a couple of years when I wasn't very happy. Suffice it to say that I've been looking forward to hearing Jeanne d'Arc in concert since the Carnegie Hall schedule came out in March, and moreover since about 2003. Having heard it, I look forward to hearing it in concert again someday, and if someone told me today it'd be in 2021 then I'd be happy enough. It was great that I could bring Maddie, who enjoyed it enthusiastically (and had fun seeing Carnegie Hall for the first time, which very exciting). Writing a descriptive walk-through of Jeanne d'Arc takes a while, and I'd recommend that the intrigued should get a hold of the Kent Nagano CD on Deutsche Gramophon and give the thing a listen. To describe some aspects of the performance: visually, the stage was remarkably crammed full of performers, with several risers full of choristers and the orchestra squished into the space in front of them. The actress singing Jeanne was the bilingual Caroline Dhavernas, who apparently played the lead role on TV's "Wonderfalls," although I never watched that show. She was perfect for the part, as far as I could tell (without understanding French, I mean), embodying a powerful, bullheaded, precocious, and still vulnerable young spirit. The chorus sang with wonderful strength and impressive precision, especially considering that it was a combined force of three university choruses (from Peabody and from Morgan State University). Certain acoustic imbalances inevitably came up with the solo singers or the ondes, but all in all the sound mix was OK. Honegger used an orchestra with 3 saxes in place of horns, which provide not only zest in the jazzy sections but also an exotic, clear, robust sonorousness when exposed in the orchestal texture, especially so when played in opposition to the chorus. The early highlight of the performance was Jeanne's trial by the animals, which was appropriately raucous and honest-to-god funny, with a very game supporting actor braying out the donkey's role with a cracked voice and ondes-ist Cynthia Millar playing the related electronic hee-haws so that they were genuinely hilarious. The seventh of eleven scenes, a short one, portrays Jeanne back at the stake, distant bells tolling as the voices of St. Catherine and St. Margaret come to her. To me it's always been the most moving scene, and musically it germinates the crucial "Fille de Dieu, va va va" theme, so it's a major crossroads of the entire work. And here there was a very scary flub, coming out of nowhere during a heretofore very tight performance. The saint soloists, I think it was, made an emphatic entry one or two measures early, thus prematurely jumping a key change, taking some fraction of the orchestra with them, and immediately unwinding the orchestra's coherence. For about half a minute the ensemble, heavy like a listing battleship, churned forward under a frightening threat of coming apart; the magnificent upward melodic streamers that were supposed to be pulsing through the high strings went slack and out of sync. But the center held, and control was regained. I've never been so terrified while attending a concert. For a few minutes I was put out that they booted my favorite half-minute stretch of the piece, but equanimity returned to me as always, mingled with a lingering ill ease that something else might go wrong. (This is an emotionally draining way to listen to a piece of music you love, incidentally.) Nothing else went wrong, happily, although in the back forty minutes there are more stretches where the sheer coordination of the full group becomes noticeably imposing; Alsop compromised on some pokey tempos and scooped these great big unambiguous downbeats out of the air. Jeanne d'Arc Bucher was not exactly composed with a 21st-century American orchestra's rehearsal-time resources in mind. But the climactic scene was riveting: the chorus personifying hatred and sympathy in intense counterpoint, the desperate Jeanne consoled by the otherworldly saints' voices, the powerful chords of her transfiguration blazing beautifully out into the concert hall. Honegger concludes with a brief, indelibly touching choral epitaph on the words "Greater love has no man than he who gives his life for those he loves," or rather more mellifluously, "Personne n'a un plus grand amour que de donner sa vie pour ceux qu'il aime." So that's Jeanne d'Arc, and despite having heard it live in Vienna and on CD innumerable times since then, I feel like I've finally heard it for the first time. Maddie can sing "Fille de Dieu, va va va" to me now when we're walking down the sidewalk, which pleases me to no end. I woke up at 4:30 this morning and couldn't fall back asleep, various out-of-order shards of Jeanne d'Arc coursing through my thoughts, along with an echo of the worry about the performance unraveling and a somewhat feverish idea of preserving new, authentic sonic memories from the concert hall in the face of the deeply ingrained but flatter sonic memories that come from years of listening to the same recording. Nineteen hours later my mind seems to have wrapped itself around the experience more completely. I don't feel like I completely understand the spell this piece casts over me. Maybe there's just got to be one piece that does that, but if it's Jeanne d'Arc then I'll roll with it, and just hope that it reappears in real life one of these days. 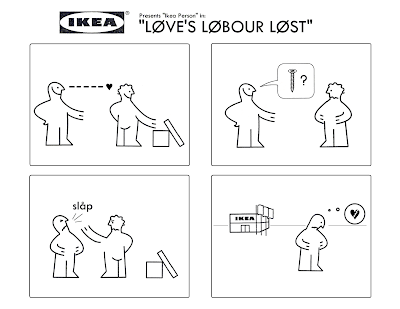 Jack asked me a couple of weeks ago, "I just randomly thought of that cartoon you made out of the Ikea people a few years ago. Do you still have that?" Indeed I do, and here it is for the blog, seeing as I'm better at dredging up old the old nonsense than generating the new these days. 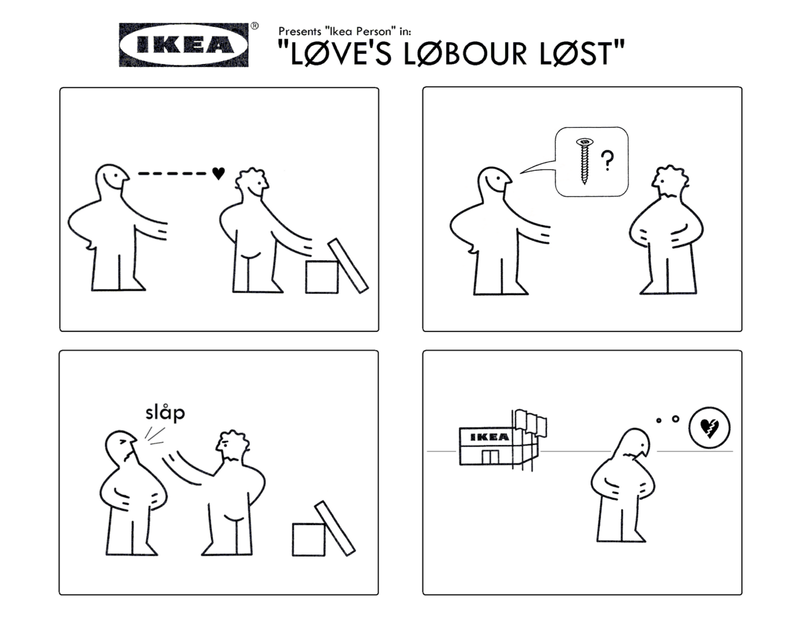 I originally conceived it as the beginning of some larger effort, but in its four-panel entirety it's a fine testament to what I could accomplish in an single evening in 2005 with MS Paint, MS Word, a scanner, and a stack of Ikea assembly instructions. I may become an Ikea Person of sorts again soon since Kyle and I are in the process of finding an apartment and moving in together. (I'm referring to furniture shopping here, not heartbreak. Obviously!) It should be a pretty fun way to spend November, all in all.